5 Seconds Of Summer bassist Calum Hood recently revealed in a new interview the release date of the band's long-awaited debut album. When speaking with Seventeen Magazine, the Aussie native confirmed the pop/rock quartet's full-length will see the light of day on July 22nd. You can read an excerpt from the article below. 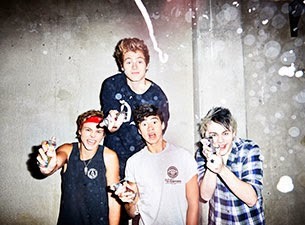 "Incredibly talented, hot Australian accents, and super down-to-earth—can 5SOS get any better?! If you're officially as in love with these dudes as we are, be sure to catch them on the road with One Direction this summer, and get ready for their debut album, out July 22!"